obligation free quote or visit our Online Shop to view the complete range of Tetlow and Woodrow Kilns. The choice of a kiln is seldom a simple one and involves many considerations. *Reduction firing in gas kilns allows for greater colour experimentation and versatility in firing results. Gas kiln installation, alterations and repairs must always be carried out by qualified Gas Fitter. Stainless Steel Casing – for a longer working life. Kiln Stand – these stands are fitted with castors so that the kiln may be moved easily. Time Clock – to take advantage of off-peak electricity rates. Temperature Controller – for total control over the firing of the kiln. Firing your electric kiln for the first time…. Before you unpack your kiln and all its furniture, you must consider where you are going to position it. There are several issues related to safety when making your decision. Your kiln should be kept a minimum of 60 cm from all walls, except in the case of brick walls, where at least 30 cm is recommended. The kiln should stand on a fire retarding surface such as a concrete slab or floor. We recommend that the electrical supply to your kiln is fitted with an isolation switch so that the supply can be switched off quickly in case of an emergency. Adequate ventilation is essential when firing. This can be supplied through an open window, exhaust fans or ventilation system. Ventilation is necessary to prevent the build up of fumes produced as a by-product of firing. These fumes can be in the form of gases, steam, lead vapours or acid vapours depending upon the clay bodies and glazes being fired. 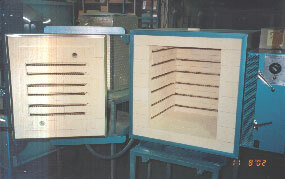 It is recommended that the first firing of a new kiln is a slow firing, with the kiln empty, to a temperature 10% – 15% less than the maximum temperature of the kiln (approx. 1100 degrees Celsius, cone 03). This is to enable the cement to mature and to remove any moisture from the brickwork. To commence your dry-out firing, fit cone 03 into cone stand, close kiln door and check that the cone stand is still set. Turn on energy regulator to 10% and fire kiln for eight hours, then turn regulator to 30% for six hours. Then turn regulator to 60% for six hours and finally turn regulator to 100% for a further four hours. This conditions the elements for longer life. Do not open your kiln until it has cooled completely. After a few firings, the dark stains sometimes present in your new kiln will disappear. While the kiln is firing, we recommend that you apply kiln wash to all kiln furniture to prevent pieces sticking during firing. All kiln furniture must be completely dry before starting to fire. Should you have any problems or require further information, please do not hesitate to contact us.